David Page and his wife, Barbara Shinn, own Shinn Estate Vineyards and Farmhouse, one of the North Fork of Long Island’s most widely-praised wineries. Here, Page’s local gift ideas, favorite holiday drinks and more. What are your 3 favorite holiday food gift ideas? Organic Chicken CSA from Browder’s Birds. 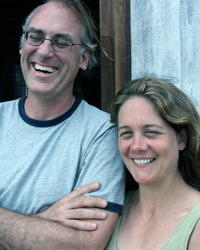 The Browders are the first to raise organic chickens on the North Fork. We’re subscribers. It’s so nice to have something so fresh and local delivered to us once a week, and their birds are especially wonderful. A gift certificate to Vintage Tours, North Fork, Long Island. Jo-Ann Perry is a native, a Southold girl who grew up in and around the North Fork. She’s watched all the changes over the past 30 years very closely. She does a fantastic job of introducing people to the bounty of the region. A gift certificate to A Taste of the North Fork. They sell dozens of locally made products—mustards, vinegars, spice mixes, soup bases—all really fun, all made by somebody who lives and works here. Everything but wine. We use our own eau-de-vie, which we distill on the property, but any good brandy or eau-de-vie will work with either one. I just started using a new pimento bitters from Dale DeGroff that I love. It’s like Angostura on steroids. It’s perfectly imagined, it gives you the sense it’s been on the market for 100 years. But I also like Fee Brothers’ fruit-based bitters, especially their cherry bitters and their rhubarb, too. Invite a farmer. Knowing who grows your food makes food taste that much better. There’s also fewer and fewer of them in our country, so if we can feed them, maybe they’ll stick around a little bit longer. Can you share 5 top places not to miss on a holiday trip to the North Fork? 18 Bay on Shelter Island for dinner. In an old farmhouse on Shelter Island, the restaurant is run by a young couple, Elizabeth Ronzetti and Adam Kopels, and in my view no one else has captured local cuisine better than they have. I moved to San Francisco in 1978 and went to Chez Panisse that year or the year after. And there has never been a restaurant on the East Coast that reminded me so much of that experience until this one. They’re somehow channeling that restaurant in a way that is still unique to them. It’s also a very peaceful, quiet location, and spectacular food. First and South in Greenport for lunch. Greenport Village is a hip little town. It’s a maritime community, but this restaurant is off the beaten path, not on the waterfront. You can dine there in about four different environments: out on the porch, in the front garden, in the bar, or in the slightly more formal dining room. But mostly it’s a very casual place that’s light-filled and bright, with extraordinary food. Barbara and I took my mother there for lunch recently; they make really good frites there, so Barbara had the black bean burger, my mom had a beautiful corn-and-clam chowder and I had a cheeseburger that was pretty killer, with homemade ketchup. One entire wall of the restaurant is filled this beautiful chalk mural of North Fork places to go and visit, to give you more ideas. Love Lane in Mattituck for shopping. Love Lane is one block long, but it’s got a wonderful historic feel to it and lots of local shops. There’s Love Lane Market where you can buy handmade pastas and local Charolais beef from Long Island’s own McCall ranch and winery. Then there’s the wonderful Village Cheese Shop, which has at least 200 selections, including many from New York—all of the North Fork cheeses. There’s the Love Lane Sweet Shoppe that sells great chocolate, and a new bookstore, BookHampton. It’s sweet that someone would think to open a bookshop these days, but now we have one! There’s even a great little café called Love Lane Kitchen. Unique Antique Designs, in Southold. Southold’s Main Street is changing rapidly, and I believe wine has a lot to do with that. I first traveled to the Napa Valley in the late 1970s, when all you found there were wineries. Restaurants were hard to come by, and purveyors of local artisan foods even harder to find. All of that seemed to grow out of the wine industry, and we’re seeing the same thing happening here on the North Fork. Southold’s Main Street has three really cool antique stores right in a row, my favorite being Unique Antique. Bundle up and take a walk on the beach at Orient Beach State Park. Every time Barbara and I walk in Orient state park, we are completely transported. You see things you wouldn’t expect to see on the East Coast, and certainly not on Long Island, like little succulents and cactuses. They help explain how we can grow wine here, since we do live in a more moderate climate with all these other microclimates associated with it. But the park is peaceful, it’s uninhabited, and I love winter beach walks even more than summer beach walks because it’s easier to disappear from the rest of humanity. And it’s not that long a walk—I think it’s like two miles from end to end. At the far end there’s Orient Point lighthouse, which we call Bug Light because it looks like a large insect standing out in the middle of Peconic Bay. At the holidays we’re known for our roast turkey, roasted in our wood-burning oven, and our Charolais beef rib roast from McCall ranch and winery. Friends of ours who are here with us during the holidays really don’t want to be invited back unless they know we’ll be serving those. You know how it is around the holidays, you want the same foods, those same memories over and over again. This year for the first time we’ll serve organic turkey from Deep Roots Farm a new farm run by a couple who also work in our tasting room, Brie and Tom Hart, we’re very excited about that. Putting Food By, by Ruth Hertzberg, Janet Greene and Beatrice Vaughan. The book was first introduced to Barbara and I by Robert Stelling, the chef and owner of Hominy Grill in Charleston, South Carolina. Robert worked for us for a couple of years when we owned Home Restaurant, and taught us how to can way back in about 1993 or 1994. So we think of him when we put food by, and those late nights in the restaurant putting up okra or dilly beans, or relishes of one kind or another. And Barbara has carried on that tradition here at the Farmhouse. She grows a very large farmhouse garden here, and she’s given us a pretty deep pantry. She is always referring to the book. I love the name, too: Putting Food By is so historic, so old and so important. Keep your holiday meal festive and communal by putting the kitchen talents of your guests to work. Even if it’s just sending a guest out to the garden to snip herbs, it changes their experience, and draws them closer to the food, closer to the ground. No matter where they’re from or what they do, if they go out and cut the thyme for the roasted bass we’re having for dinner that night, they pay attention to the thyme when they’re eating. I think it’s a miracle.